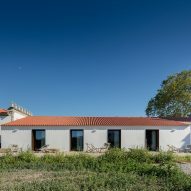 Portuguese studio PROD has converted this 18th-century house and stables in northern Portugal into a 15-bedroom hotel, adding an elevated wooden bridge and a vaulted roof to the kitchen. 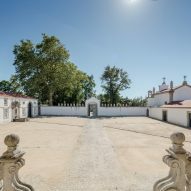 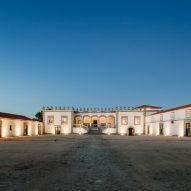 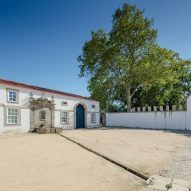 The Paço de Vitorino estate comprises a three-storey residence on the eastern side of the plot, and two wings on the northern and southern side that were previously used as a warehouse and stables. 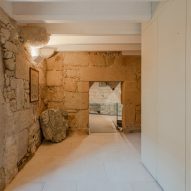 There is also a small chapel placed alongside the entrance wall on the western side. 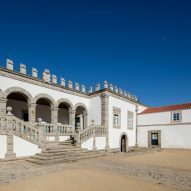 Together, the wall and the richly adorned facades of the house and outhouses define a central square. 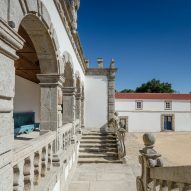 Designed for the heir of the Paço de Vitorino Count, who died in 2010, PROD restored existing features where possible in the six-bedroom house, and reconfigured the two outbuildings to create nine extra bedrooms for the hotel. 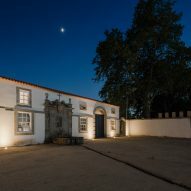 Under the instruction of the client, the architects used more traditional styles in the main house, while contemporary finishes were chosen for the converted spaces. 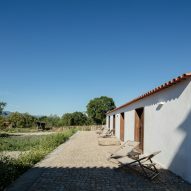 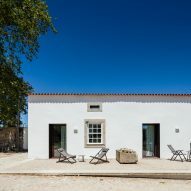 "For the spaces in which we maintained similar uses – such as in the main house – their brief was to try to recover the previous typical domestic atmosphere," architect Paulo Lago de Carvalho told Dezeen, "while in the new spaces – former animal stables and the cellar in the basement – the brief was to transform it with a contemporary design." 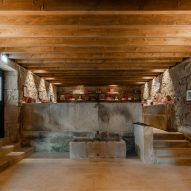 An elevated passage added above an internal courtyard in the main house provides an indoor link between the bedrooms, and the eating and socialising spaces. 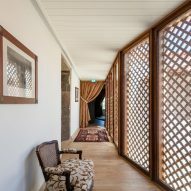 The timber structure features a latticed grill with glass panels, which allows speckled light to illuminate the walkways. 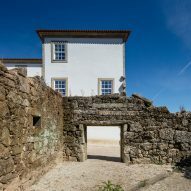 "This new passage was designed to be a light timber structure, with a crossed-shaped grill covering the full size glass panels," explained Carvalho. 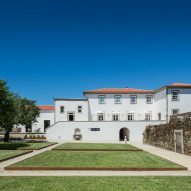 "Its angular shape tries to respond to the corner configuration of the patio granite passage." 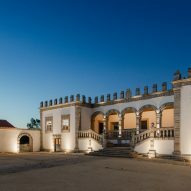 Another bridge that links the interior spaces to the baroque gardens, which features pools and statues, is made with dark steel and glass to contrast the existing granite walls and timber ceilings. 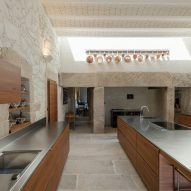 Inside the main house, the team inserted a vaulted roof above in the kitchen. 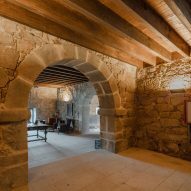 It stops just before the existing chimney to allow for a large skylight to flood the space with natural light. 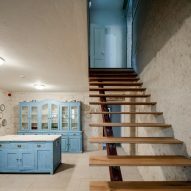 Rough stone walls lining the kitchen are painted cream, and the workspaces are made with wood and topped with steel. 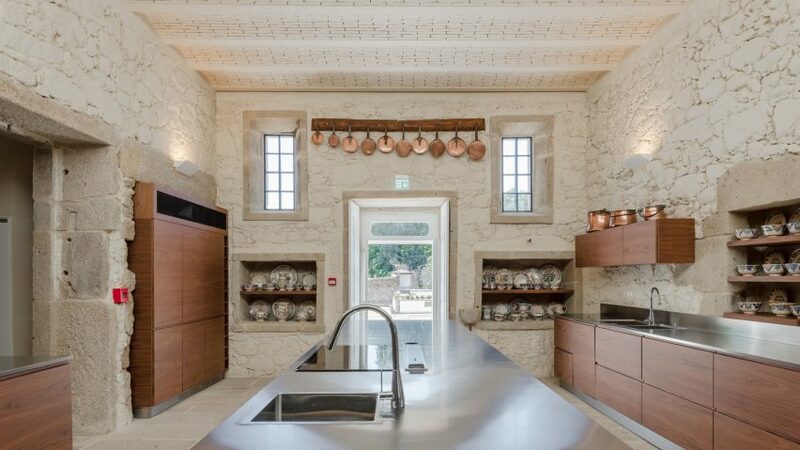 Copper pans double up as decoration for the space. 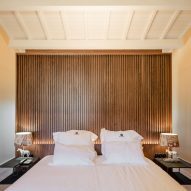 Along the outer side of the bedroom wings, the team added a series of recessed openings. 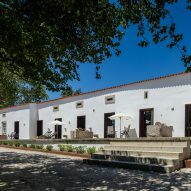 The Corten steel framed windows are slightly recessed and open from the bedrooms to a patio area for sunbathing, and the baroque garden surrounding the hotel. 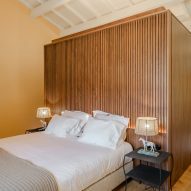 Inside the bedrooms, the architects have inserted a central volume made of ribbed wood that remains distinct from the original structure. 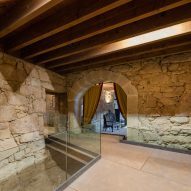 The box houses marble bathrooms and wardrobes. 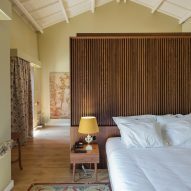 The style starkly contrasts the more traditional features of the bedrooms in the main house. 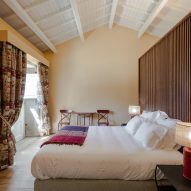 "The contrast in finishes is most evident in the bedrooms. 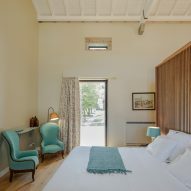 That contrast is evident, since the wings bedrooms layout is based on the 'wood cube' placed in the middle of the space to organise it and enhance the large space where it rests, while in the main house the bedrooms are more traditional," said the architect. 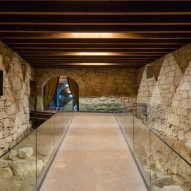 "These elements were placed strategically at a distance from walls and ceilings to simultaneously frame the features, organise the programme and enhance the surrounding space," he explained. 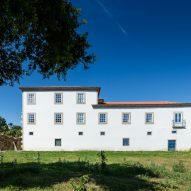 Portuguese studio PROD was founded by Paulo Carvalho and Susana Correia in 2009. 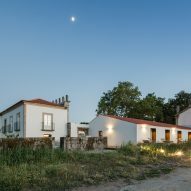 Other projects by the architects include a holiday home on the outskirts of Porto made up of four house-shaped buildings.